A favorite bookstore, both for doing events and browsing–their non-fiction selection can’t be beaten–is Mike Barnard’s Rakestraw Books in northern California. I mentioned Galatea’s obsession with rabbits–or rather, zabbits–and Mike asked if we’d ever read Spotty. We had not. Spotty is cute. In fact, it gets no cuter than Spotty, a little rabbit who is born with brown spots all over him. It is a classic outcast tale–all Spotty’s brothers and sisters are pure white with pink eyes, and his mother worries that he won’t be accepted. At first, Spotty doesn’t understand the concept “different”, but when he does, he tries using spot remover on himself and, that failing, sets off alone in the world. Gal’s favorite page is the one where Spotty’s siblings go looking for him, searching the old-style ice-box and oven, although she thinks they’re looking for pizza. One of the great things about reading to a two-year old is that you don’t have to follow the text. Gal also loves the Momma rabbit crying, but then she loves the image of anyone crying. When I ask Gal how her day has gone, her own tales–narrated in strings of adjectives, nouns, and unconjugated verbs–are rarely accurate, but the one detail she unfailingly gets correct is the moment when she or one of her playmates cry. Not that it makes her sad–crying delights her. It is an action brought on by emotions that she understands perfectly, and the understanding brings her immense joy. Or that is at least my own armchair psychologist reading of it. 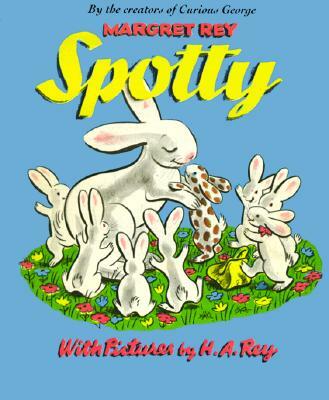 Spotty is one of the more popular non-Curious George books by Margret and H. A. Rey. It has too many words, as do so many books of that era, but thankfully Gal does not as yet demand that we read every story exactly and unabridged. While the book does not have the iconic value of Curious George–nor does it deserve it–the drawings are better, or the story at least plays better to the strengths of H.A. Rey, with its enormous array of adorable bunnies.